Spring has officially arrived, although you wouldn’t know it in many parts of the country. With all of that snow on the ground, what is an anxious gardener to do? Just in time for planting season, Click & Grow is about to release its second-generation Smart Herb Garden for indoor cultivation. Unlike its first incarnation, which only allowed room for one plant, its new model lets you raise up to three herbs at once. Seeds come included and embedded in a cartridge, ready to be inserted into the growing bed. The design now also features a built-in light that can be plugged in to let artificial sun shine whenever it is needed. Click & Grow has already sold over 50,000 of its Smart Herb Gardens and is ready to germinate its second crop. 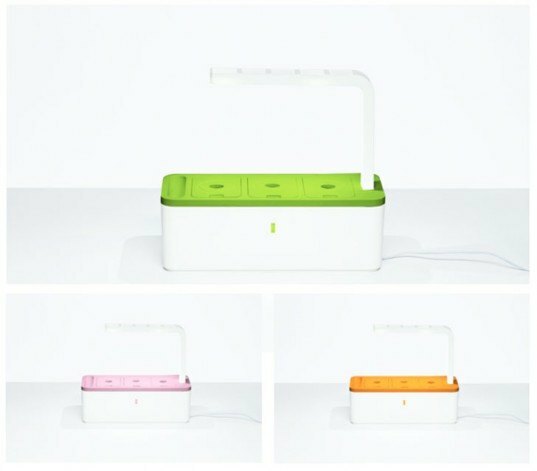 Launching its next generation on Kickstarter, the system took user feedback into account and expanded its growing bed and added two 3W LED lights. Unlike the first model, it operates on 4 AA batteries, letting it be set up away from an outlet. 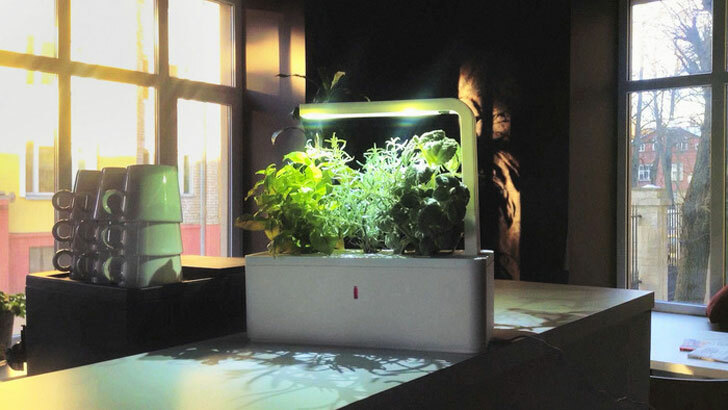 The Smart Herb Garden does not require soil and instead uses a nanomaterial growth medium that optimizes the amount of air, water, and nutrients reaching the roots. The starter kit comes with cartridges that can be directly inserted into the expanded bed containing basil, thyme and lemon balm seeds that can be refilled for chili peppers, mini-tomatoes, spinach, peppermint, salad greens, and strawberries. No fertilizing needed! The current prototype is expected to retail for $79, but early contributors to the campaign can score the white version with three cartridges for only $39. Colored lids are are available with larger donations, and the Gardens are expected to ship by September. Spring has officially arrived, although you wouldn't know it in many parts of the country. With all of that snow on the ground, what is an anxious gardener to do? Just in time for planting season, Click & Grow is about to release its second-generation Smart Herb Garden for indoor cultivation. Unlike its first incarnation, which only allowed room for one plant, its new model lets you raise up to three herbs at once. Seeds come included and embedded in a cartridge, ready to be inserted into the growing bed. The design now also features a built-in light that can be plugged in to let artificial sun shine whenever it is needed.